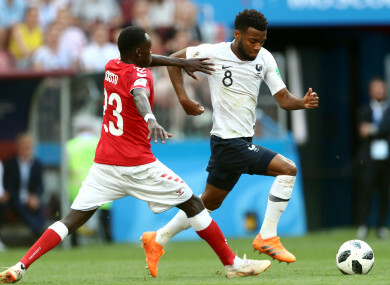 Denmark's Pione Sisto (left) and France midfielder Thomas Lemar. FRANCE SECURED THEIR place ahead of Denmark in Group C following a 0-0 draw in Moscow that could set up a heavyweight World Cup clash with Lionel Messi’s Argentina in the last 16. Email “France and Denmark stroll into the last 16 after drab affair in Moscow ”. Feedback on “France and Denmark stroll into the last 16 after drab affair in Moscow ”.